Click here to order a copy. Shopping with Amazon.com is 100% safe. This trio of authors from Westmont College attempts a thorough and objective analysis of the state of the Jesus Movement as of the fall of 1971. They begin with a review of other attempts to cover the same or similar ground and indicate the shortcomings of each, which they have consciously attempted to overcome. 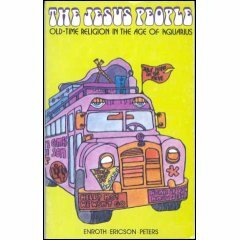 They pinpoint the origins of the modern Jesus Movement in the beginnings of several ministries in 1967 and 1968, one of the first of which was the conversion of dope-addict Ted Wise in 1966 in Sausalito, California; Wise is now in charge of a drug prevention center in Menlo Park, California, The most striking fact about the Jesus People is this: whereas theologically they are fundamentalists, sociologically they are anything but. The authors devote six chapters of historical resumes of the main branches of the movement, four chapters to a summary of their theological doctrines, and two chapters to an overview and analysis. Among the groups treated are the Children of God-possibly the fastest growing group, with the strongest organization of any group, and emphasis on 100% commitment to Jesus including alienation from all other relationships, a post-tribulationist view of the second coming, and frequent charges of kidnapping against them; the Christian Foundation of Tony and Susan Alamo-the most attractive group for black converts, characterized by a ceaseless emphasis on the fear of God, the insistence on the King James translation of the Bible as the only inspired version; the Christian Brothers of Fresno, California, who also emphasize doom and judgment. These three groups are also characterized by their emphasis on communal Christian living. Also included are summaries of the careers of Arthur Blessitt, Minister of Sunset Strip; Duane Pederson and the Hollywood Free Paper, the simple approach to evangelism contained in which has been the pattern for many other Jesus People newspapers; singer and composer Larry Norman. The Jesus Movement has produced some nondenominational “hip” churches out of their rejection of the institutional establishment churches. These include Calvary Chapel of Costa Mesa, Bethel Tabernacle in North Redondo Beach, and the Sierra Madre Congregational Church in Sierra Madre. “A unique ministry to the street people of Berkeley and the students of the University of California campus there” is provided by the Christian World Liberation Front and its superior underground newspaper Right On. This work began with Jack Sparks, a dropout from Campus Crusade. The authors feel that CWLF has “an edge on other Jesus groups in terms of intellectual and spiritual maturity,” and has been helped by the Walnut Creek Presbyterian Church. The above summary emphasizes the dominance of California in the Jesus People movement. There are other outposts of the movement throughout the United States. These include The East Coast Jesus People who publish The Ichthus, Linda Meissner and the Jesus People’s Army of Seattle (although she has more recently joined the Children of God), Carl Parks and the Jesus People’s Army in other regions of Washington and Idaho who publish Truth, Jim Palosarri and the Jesus Christ Power House in Milwaukee, Sammy Tippit and “God’s Love in Action” in Chicago, Ron Rendlemen and his work in West Chicago which achieved national notice when they successfully withstood Satanists attempting to break up a Billy Graham Crusade in Chicago; David Rose and the House of Agape in Kansas City, Missouri; Don Pauly in Florida. The Movement has naturally generated much activity on the fringes on the interface between radical and establishment Christian practice. Ex-staff members of Campus Crusade are noticeable. Hal Lindsey and Bill Counts head up the J. C. Light and Power House in Westwood, California. Gordon Walker directs Grace Haven Farm in Mansfield, Ohio. Jon Braun’s work is associated with the Brothers and Sisters of Isla Vista, California. Of established churches working in the context of the Jesus People, the most outstanding are Hollywood Presbyterian Church, and Peninsula Bible Church in Palo Alto, California. Others working on the fringe include Mario Murillo and his Resurrection City in Berkeley, David Wilkerson and Teen Challenge, evangelist Richard Houge working in the Southwest and Midwest, and Lutheran Youth Alive headed by David Anderson. Whenever a movement gets going, there are also those who associate with it for motives that are not always sincere or constructive. In this category the authors point to Ed Human and Hollywood’s gospel night clubs, the Mustard Seed in Van Nuys with the symbols but not the spirit of the revolution, a shaky alliance with classical Pentecostalists as personified in Kathryn Kuhlman, Victor Paul Wicrwille and “The Way” with its ultra-dispensationalist heresies, and the upswing in commercial music including Jesus Christ Superstar and God Spell. This is a really useful and informative treatment of the Jesus People. It is to be recommended for reading by all Christians.